A standard, straightforward, no-nonsense action straight from the 80s. Sylvester Stallone in his famous role as a rock-hard, growling human bulldozer. And when comparing him to Arnie in “The last Stand“, then Sly has stood the test of time pretty well. A tightly trained body and not too tightly drawn facial skin. The resemblance to films such as “48 Hours” and recently “The Heat” is self-evident. The latter has a female touch and realy isn’t as good as this film (lots of irritating stuff in “The Heat“). The storyline isn’t brilliant and rather simple : assassins do their job, one is eliminated, partner of the first victim starts an investigation and is assisted by the remaining hired assassin who seeks retribution for the death of his partner. And after that, it’s just checking a list and eventually finding the responsible one who gave the orders. Christian Slater plays a meaningless role (for the umpteenth time) again and Jason “Conan” Momoa puts on a decent performance as Keegan. The ruthlessness and pure aggression radiate from his character. The duel in the end between him and Sly is fine piece of work. Compared to “The Last Stand” there are a lot more action and fight scenes in this film. That’s already something more positive. It’s bloody, realistic and without much fancy footwork. In Arnie’s film, it all seemed to happen in slow motion. The one-liners and humor are also much better than in “The Last Stand“. 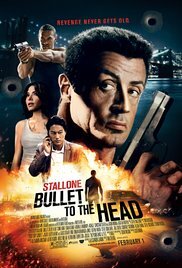 “Bullet in the head” is no real high flyer, maybe at times long-winded and boring, but it’s entertainment of the highest level.